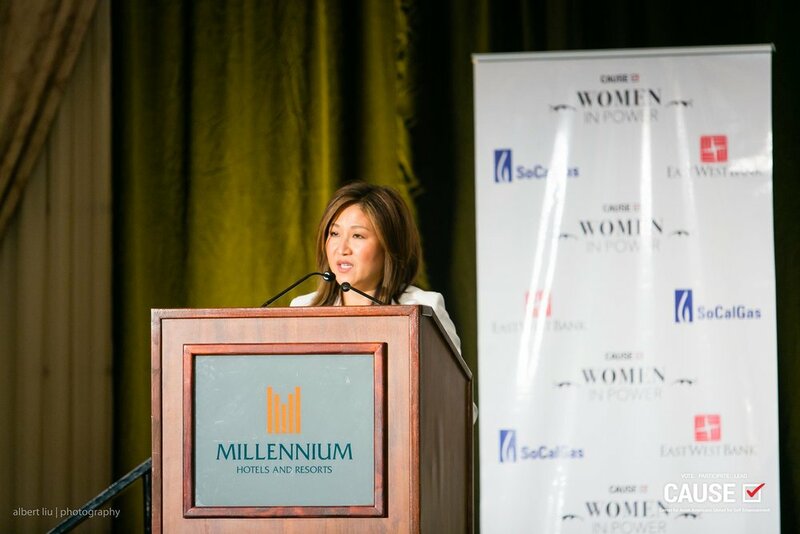 The Women in Power Leadership Conference kicked off with opening remarks from Kim Yamasaki, Executive Director of CAUSE; Nita Song, President & COO of IW Group; and Trisha Muse, Director of Community Relations at SoCalGas. Nita Song followed up with a personal story that underscored the importance of the Women in Power program and encouraged the audience to spend the day engaged in thoughtful discussion with the speakers and with each other. Shelly Kapoor Collins, General Partner of the Shatter Fund and Sachi Hamai, CEO of LA County discussed leadership styles and what it takes to succeed in male-dominated industry during the “Women Leading & Influencing” panel, moderated by Nita Song, President & COO of IW Group. Angeline Vuong, Director of Strategy & Marketing at Open Listings and Actress, Dancer, and Producer – Youtube Creative Julie Zhan participated in a fireside chat moderated by Mariko Carpenter, VP for Strategic Community Alliances at Nielsen on “Technology & Next Generation Leadership”. We thank her for all her contributions to the Asian American community and her invaluable support of CAUSE. Maria Contreras-Sweet, 24th Administrator of the Small Business Administration, was honored with a 2017 Women in Power Changemaker Award and delivered a powerful keynote about her career path as a Mexican immigrant and her vision for women as changemakers. Emily Wang, Senior Vice President & Director of Marketing and Community Development at East West Bank, delivered a few remarks regarding East West Bank’s support of the Women in Power program and how invaluable it is to recognize women as capable leaders in the corporate space. Kim Delevett, Community Affairs & Grassroots Regional Leader at Southwest, surprised the audience by offering two select conference attendees with 20,000 Rapid Reward points. Faye Washington, President & CEO at YWCA Greater Los Angeles; Taz Ahmed of 18 Million Rising & #GoodMuslimBadMuslim; and Betty Yee, CA State Controller, shared their paths to leadership and the causes they utilize their platforms for during the “Power with a Purpose” panel, moderated by Kimberly Freeman, Assistant Dean for Diversity Initiatives & Community Relations at the UCLA Anderson School of Management.